A habitat and not merely a home, this is what describes this property in the most apt manner. The house was originally built in 1900, but is now renovated to meet the prevailing trends and requirements of a luxurious lifestyle. 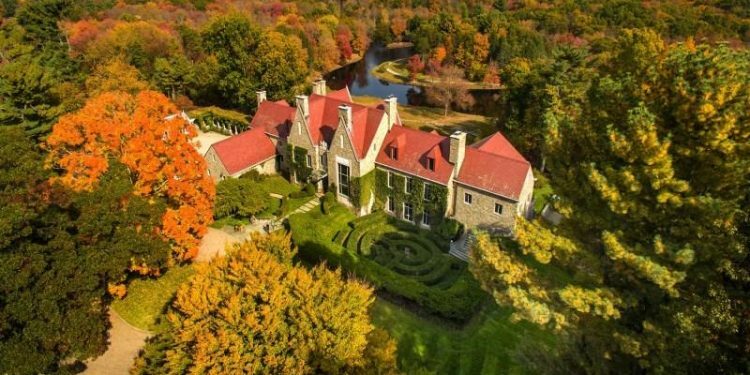 This lavish house is built in European style manor stone and stretches over 262 sylvan acres, specked with a variety of luxurious features such as outdoor pool, manicured designer garden, a quiet lake and a number of grounds where greenhouse, barns, tennis court and 4 staff residences are built. Thus, this property provides complete ecosystem to a person and makes living extraordinary. This dream-come-true property is located at New York-Connecticut border and is in close proximity to a number of natural resources such as lakes, mountains, fields etc. Thus, this house spread over an approximate area of 20,000 sq. ft. allows you to smell the nature in its purest form and also offers you umpteen reasons to come back home and enjoy your moments of leisure. This property has 8 bedrooms, 10 bathrooms and 4 partial bathrooms. Each room has interesting focal points in the form of Victorian style fireplaces around which life is happening every moment. There is a swimming pool indoors as well as another at the outside, for enjoying private bath and also for having pool side parties and get-togethers. Each and every room is adorned with large panels that keep nature just a door apart from the inmates offering them the best of the luxury and the fines company of nature. Well-aerated and amply ventilated rooms make the living spaces very much inviting and offer you ample protection from extreme weathers without cutting yourself off from the surroundings. Surrounding green spaces are designed in unique resting points such as - a tennis court, a chess like playing point and conservatory - are some of the exciting stops around the house that allow you to enjoy yourself in full privacy and unrivalled beauty. Indoor pool has Italian mosaic style sides that offer it a very splendid look. Right from the entrance that has elaborately carved huge door and a staircase on the side to the farthest room, each and every portion of this house is tastefully built and oozes loads of luxury from every inch. Marble stone, onyx, granite and stained class are employed to make floorings and other tops of various portions of the house. Priced at $75,000,000, this house is certainly a delight!